Back in January, one of my main goals for the year ahead to pay a little more attention to my skin. So far, unfortunately it's the one I haven't quite achieved. At the end of the day, by the time I've had a chance to take my makeup off all I really want to do bury my head in the pillow and conk out completely. This means that I am perhaps not so regimented with the 'cleanse, tone, moisturise' routine as I perhaps should be. As for face masks? Well they are normally resigned to weekends. In February, I'll be making much more effort to give my skin a little TLC. 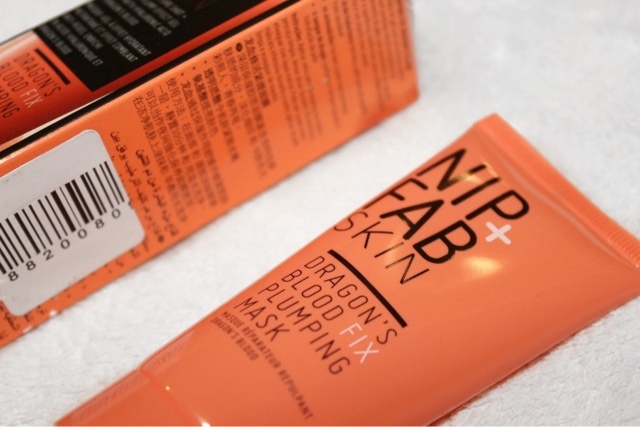 One product I think might make that all a little bit easier is the Nip + Fab Dragon's Blood Fix Plumping Mask. 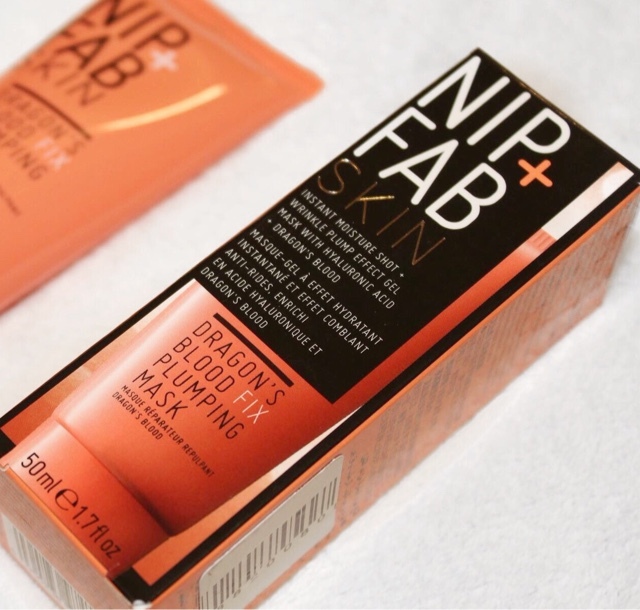 I've long been a fan of Nip + Fab, the brand endorsed by Kylie Jenner and Millie Mackintosh alike. I've tried a multitude of their other products, but the Dragon's Blood range is one I had my eye on for some time. I have to admit when I first heard 'Dragon's Blood' I presumed this was just some mythical ingredient with a cool name, because, you know, obviously dragons aren't real. With a little research, it was clear I was wildly mistaken and it is in fact a red resin extracted from certain plants. It's comforting to skin, and works to hydrate it. The other ingredients in the Plumping Mask include Hydraluronic acid (to plumps skin) and amino acids (to brighten). The product is designed to freshen up skin, plump any wrinkles and generally give you a more youthful complexion. My skin is still in pretty good shape at 23, it's not 18 anymore so it pays to give it a little extra attention. When I used it initially, the first selling point was that it's a completely clear and smooth formula. So, on the off chance I unintentionally plaster some my hair in my haste to slap it onto my face quickly, it's really not going to make an awful lot of difference. Winning. The mask can be worn in two ways; as a short or overnight intense treatment. 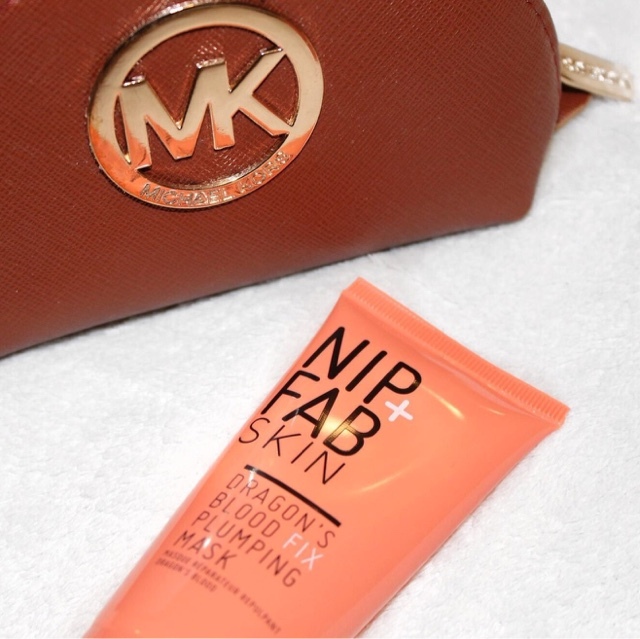 Nip + Fab advise applying a thick layer to skin and wiping off after ten minutes, or leaving it on overnight and rinsing the next morning to really work on that visage! I was really impressed that even when wearing a few layers of this mask, it still felt super light on my skin. It has a slight cooling effect too, meaning it is quite refreshing and gentle. You could try keeping it in the fridge for a little while before use, just to intensify this. So what's the verdict? I've been really thrilled with this, and it's a great pick me up when your face is feeling a bit haggard. When I washed the mask off, it felt like I'd washed away any impurities with it and left my skin glowing. I'm a pessimist when it comes to skincare at times, but this one really delivers quick results. 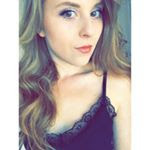 Would I use this again? Definitely, as the results were instant. Within this range, there are also there are also cleansing pads and a plumping serum. Given that I've liked the mask so much, I certainly need to try these out as well. The Dragon's Blood Plumping Mask retails at £14.95 in Superdrug, but keep your eyes out for special deals at local retailers.